Myra Lucile Askins, 79, of Fayetteville, passed away on Friday (April 12, 2019) at her residence surrounded by family. Myra was born on Sept. 14, 1939 in Lincoln County to the late David and Iris Archer Askins. 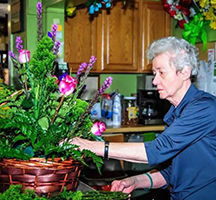 She established The Flower House in March of 1966, a staple in the community. She was a member of Washington Street Church of Christ. Survivors include her friend, Carol Hardin; nieces and nephews, Joe (Pam) Cummins, Betsy Cummins, Fran (Joey) Locker and David Grant; great-nieces and great-nephews, Will (Kerri) Locker, Sheley (Chad) Cowley, Tina Balch, Joe (Adrienne) Cummins, IV, Jake Berzett and Payton Grant; brother-in-law, Bruce Grant; and extended family, Steve Shelton and Bill Dickey. In addition to her parents, she was preceded in death by her sisters, Martha Askins, Marie Cummins and Marian Grant; brother-in-law, William Joseph Cummins, Jr.; and Charlie Berzett. A visitation with the family will be held from 10 a.m. until 1 p.m. on Monday, April 15, at Higgins Funeral Home. The family will have a private burial in Rose Hill Cemetery. Higgins Funeral Home is honored to be serving the family of Ms. Askins.